At the signing of the contract for the reconfiguration of Castlebar Golf Club were: Ger Gibney (managing director of Ryan Hanley), Jeff Howes (Jeff Howes Golf Design), Tom Martyn (hon secretary, Castlebar Golf Club), James D'Arcy (Dar Golf Construction), Gerry Needham (president, Castlebar Golf Club), Joe Beirne (Castlebar Golf Club), and Daragh O'Shaughnessy (Ryan Hanley). Front row: Rowena Kilkelly (Lady president, Castlebar Golf Club), Graham D'Arcy (Dar Golf Construction), John McHale (captain, Castlebar Golf Club), and Cora Mulroy (Lady captain, Castlebar Golf Club). Photo: Michael Donnelly. 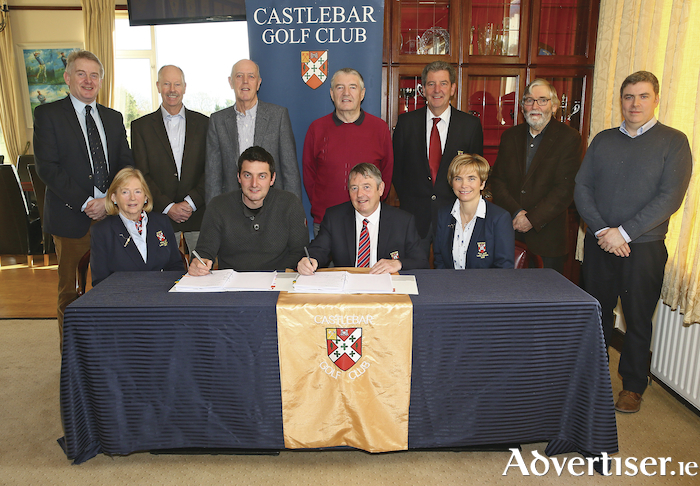 Last week John McHale (captain of Castlebar Golf Club ) signed a contract with Dar Golf for the development of a reconfigured course east of the existing course at Rocklands in Castlebar. The new development became necessary when part of the existing course was included in the compulsory purchase order for the new Turlough to Westport road. As part of an agreement reached between the club and Mayo County Council additional lands were acquired for the club by the council. Dar Golf is one of the leading golf construction contractors in the country having previously worked on The Castle GC, Douglas GC, the Hermitage GC, and numerous others. James D’Arcy said that he was looking forward to delivering an improved course at Castlebar of which all its members would be very proud. Captain John McHale said that it was a great day for the club, he looked forward to the development of the new course, and it was timely that the contract was signed on the same day as the club was accepting the Golfer’s Guide to Ireland award for the best Parkland Golf Course in Connacht. He said that the course would remain open for business as usual throughout the construction period.